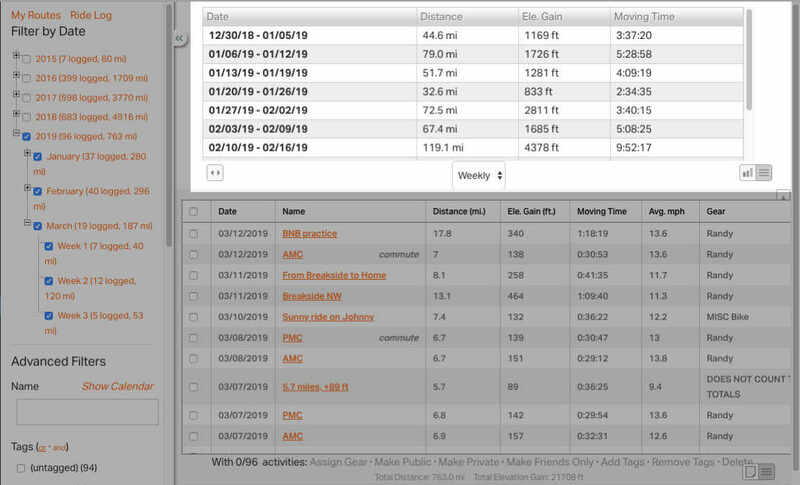 The Ride Center allows you to filter your rides by date, ride name, ride tags, bike, distance, elevation and average speed. 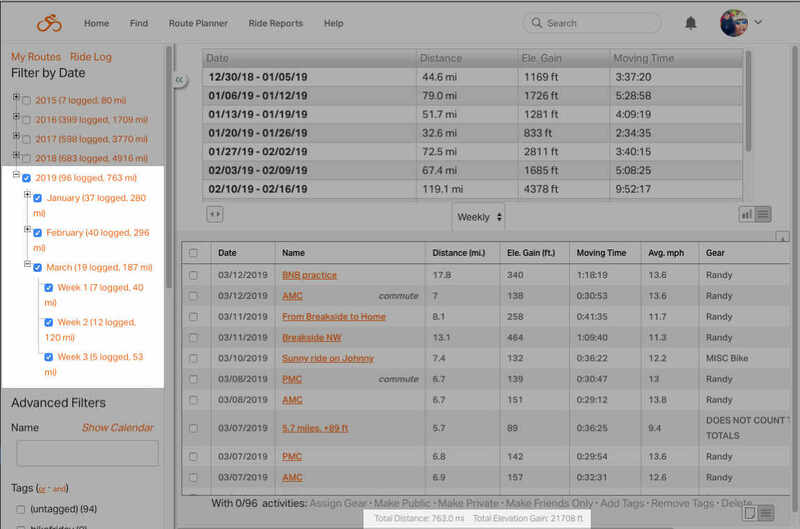 So, for example, you could quickly find out how many miles you rode your road bike in June at 18 miles per hour. You can also use Ride Center to easily batch assign bikes or tags to your rides, or make rides public or private. 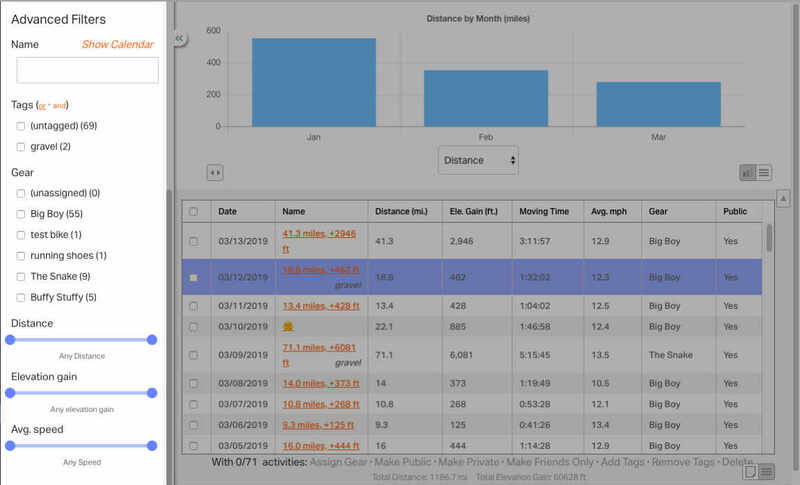 Ride Center also allows you to summarize your ride history in a graph by distance, elevation gain or moving time. You can also sort by month, week or year. 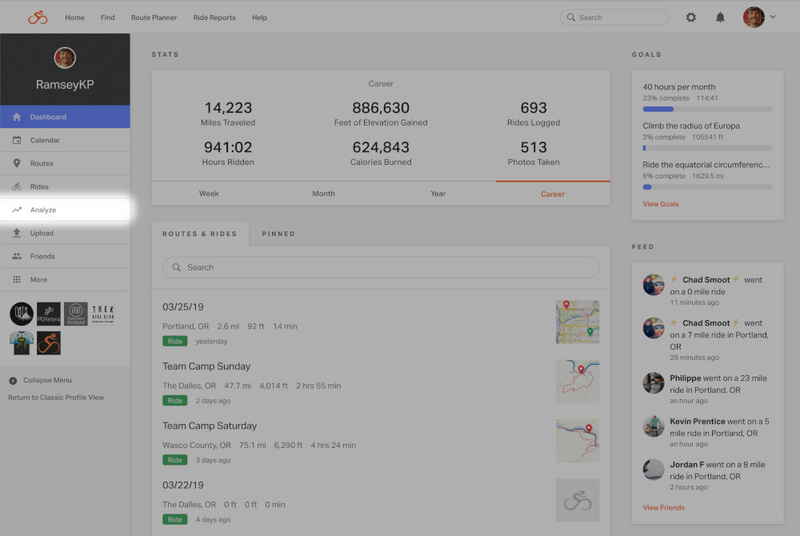 Premium users can quickly access the Ride Center by clicking Analyze in the left navigation panel. 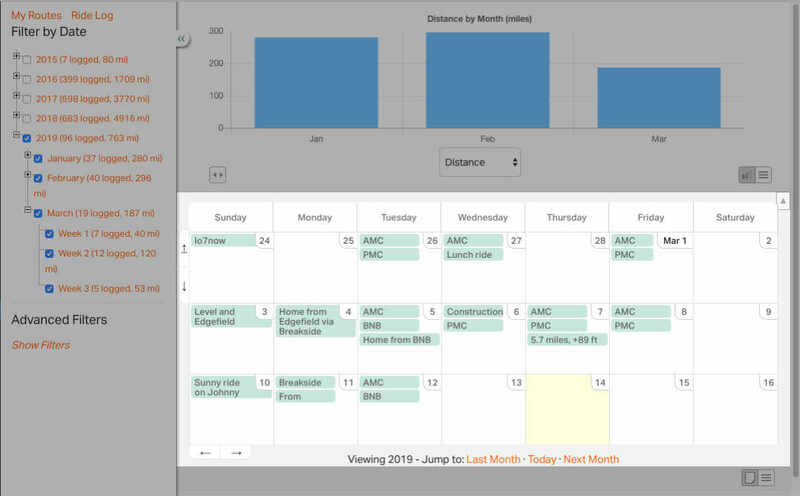 The calendar view shows all your rides for the month. 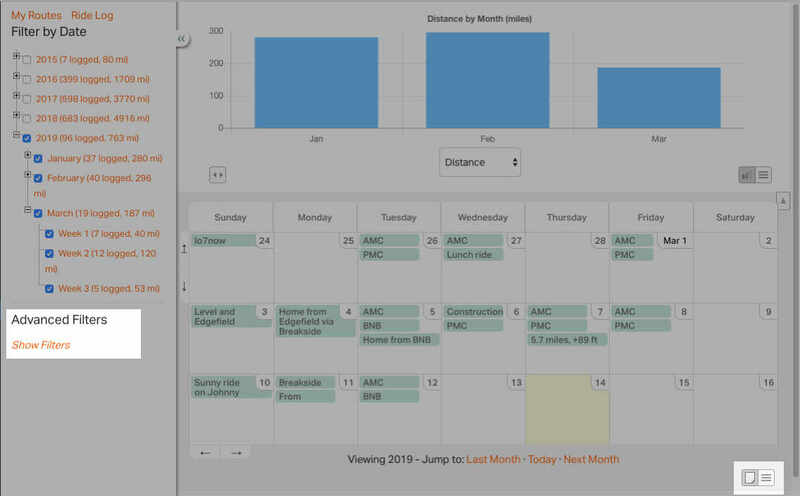 Click on the day to manually add a ride or to enter your weight for the day. 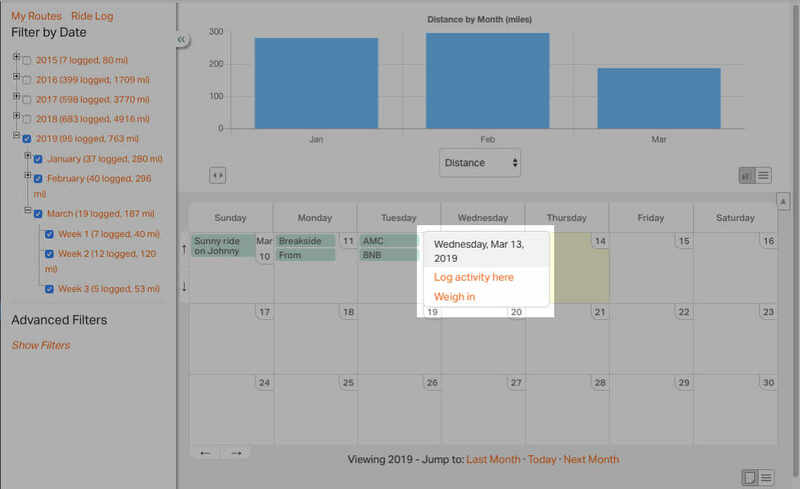 While in the calendar view, clicking on any day allows you to manually log an activity or to log your weight for the day. Switch from a calendar view to a list view by clicking SHOW FILTERS on the left, or the list view button in the bottom right corner. In the list view, you can place check boxes next to multiple rides to change them all at once like Assign to Gear, Make Private, Make Public, Add Tags, Remove Tags, or Delete. Assign Gear – Assign a bicycle or other piece of gear to the ride. Check out this page about Adding Gear. Make Public – Public rides are shared with everyone that can access the site. Make Private – Only you can see these rides. Others can see the ride IF you share it with them. Add Tags – Tags allow you to sort by key words such as “touring”, “race”, “training”. Remove Tags – Allows you to choose which tags are removed from the selected rides. Delete – This allows you to delete multiple rides at once. All deleted rides permanent and cannot be recovered, so we recommend using this with care. Filter by Date. Clearing all the dates will display all the rides in your profile. Name Field – Search for the name of a ride. Tags – These are defined by you. And/Or. Gear – Show only rides associated with the gear that is checked. Distance – Use the slider to set a minimum and/or maximum distance. Elevation Gain – Use the slider to set a minimum and/or maxium elevation gain. Avg Speed – Use the slider to sort by a minimum and/or maximum average speed. 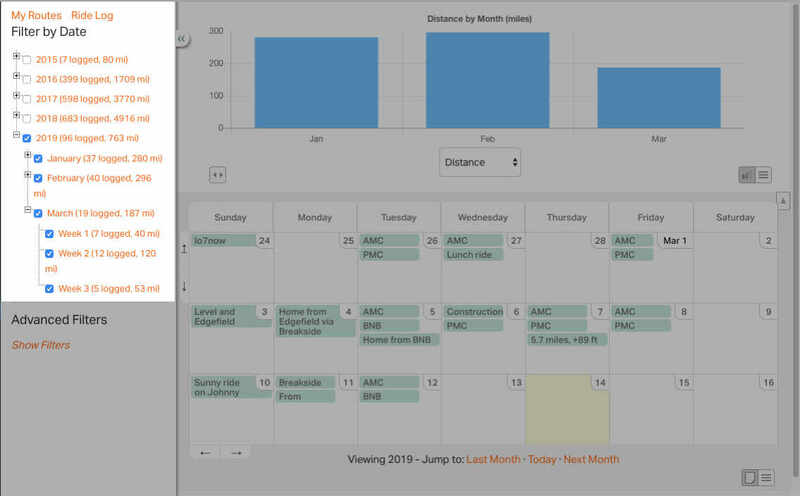 View graphs for the week, month, or year to display distance, speed, or elevation gain for the selected time periods. 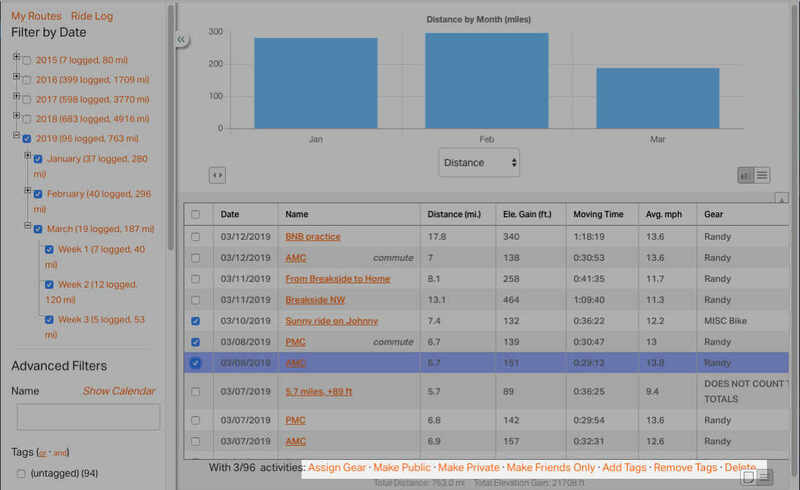 You can also see the total distance and elevation gain filtered by selected criteria at the bottom of the screen. For instance, you can see the total distance you’ve ridden on your mountain bike by selecting your mountain bike on the left-hand side. You can also select dates or tags, or select ranges of distance and/or elevation. 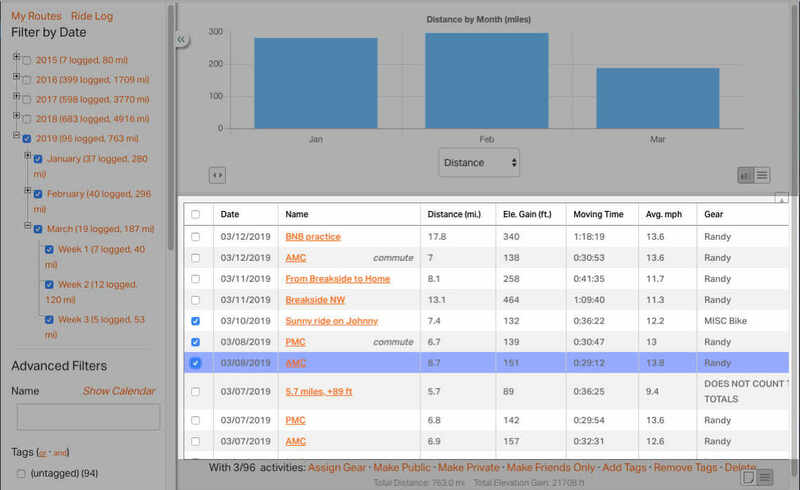 The ride log will update the list to show only rides matching your selections, and the total distance and elevation logged on those rides only will be automatically displayed.